Muthoot Homefin India Limited NCD Issue 2019, Features, Credit Rating, Reasons to Invest, Price, Date, Allotment, Listing, Reviews, Status & How to Apply? The Muthoot homefin limited NCD was incorporated in the year26 2011. The company is currently the wholly owned subsidiary of Muthoot Finance Limited (“MFL”), which is one of India’s largest and finest gold financing companies by loan portfolio. 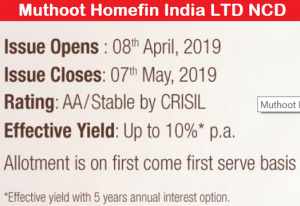 Muthoot Homefin India NCD for April 2019 would open for subscription on 8th April 2019. It is a non-deposit taking housing finance company and were registered with national housing bank. It is offering NCDs for the tenure of 24 months, 38 months, 60 months and 90 months tenure. You can double money in 7.5 years with these NCDs. The return is as high as 10 % per annum tempting and persuading the investors now. Nowadays, if we look upon the current scenario we can see that bank offer low rates on fixed deposit. Should you invest in Muthoot Homefin India NCD of April 2019? What are the hidden factors an investor should consider before investing Muthoot Homefin India NCD of 2019? Stay tuned with us to learn about “MUTHOOT HOMEFIN INDIA NCD”. Non converted are unsecured bonds that cannot be into the company equity or stock. It usually has a higher interest rate than the convertible debentures. How to Apply for Muthoot Homefin India NCD? Should you invest in Muthoot Homefin NCD? The Muthoot homefin company is indulged in providing affordable housing loans to the Lower Middle Income (“LMI”) groups and economically weaker Sections (“EWS”) of society in tier 2, tier 3 and tier 4 cities. Company customers comprise primarily informal and formally salaried workers and self-employed individuals. As on September 30, 2018, they provided loans to customers located in 11 states and one union territory, namely Andhra Pradesh, Gujarat, Haryana, Karnataka, Kerala, Madhya Pradesh, Maharashtra, Punjab, Rajasthan, Telangana, Uttar Pradesh, and Chandigarh. Muthoot Homefin India is issuing secured redeemable Non-Convertible Debentures (NCD’s) to the tune of Rs 150 Crores with an option to retain another Rs 150 Crores over subscription totaling to Rs 300 Crores. It comes with 10 different options, which contains 24 months, 38 months, 60 months and 90 months tenure NCDs. NCD’s are available in 10 different options. The interest of these NCDs is payable monthly, annually and on maturity. Crisil has rated these NCDs as AA/Stable. The rating of AA/Stable indicates that instruments with this rating are considered to have a high degree of safety regarding timely servicing of financial obligations. Such instruments carry very low credit risk. Edelweiss Financial Services is the lead manager for this issue. 1) The revenues are at Rs 24.16 Crores in FY2017 to Rs 117.06 Crores in FY2018. Its revenues for 6 months ended Sep-2018 was Rs 103.97 Crores. 2) Its profits are at Rs 5.28 Crores in FY2016 to Rs 22.25 Crores in FY2018. Its revenues for 6 months ended Sep-2018 was Rs 20.97 Crores. Why not to invest in Muthoot Homefin India Mar 2019 NCD? the business of the company is consistently growing in the past. In an event of loss or its inability to maintain the growth may have a material adverse effect on its business. They may experience difficulties in expanding their business into new regions and markets. They are subject to periodic inspections by the NHB. Non-compliance with the NHB’s observations made during any such inspections could adversely affect its reputation, business, financial condition, results of operations and cash flows. In order to strengthen its growth, they will need to maintain a minimum Capital Adequacy Ratio (“CAR”). investors can check all the risk factors in the final prospectus of the company. Dear Investors, you can apply to these NCD in the demat form only. There would not be any interest on the non-convertible debentures. All you need is the demat account you can log in to your account and go to IPO/NFO/NCD section and apply for the same. The process of applying NCD would be through ABSA (Your amount would be blocked initially and upon allotment, your amount would be deducted and NCD allotment would be done, else your amount would be unblocked) You can reach out to any of the lead managers websites to know more details on how to apply them. How to Apply for Muthoot Homefin India NCD through ASBA? When this Muthoot Homefin India NCD of 2019 would get listed on BSE? These Muthoot Homefin India Limited NCDs of April 2019 would get listed on BSE after 6 working days from the date of closure. Means it would get listed approx. on 16th May 2019 assuming that it would continue till 7th May 2019 i.e. the last date of subscription. If it is subscribed earlier and subscription closes, it would get listed after 6 days from such closure. How Muthoot Homefin India April 2019 NCD are taxed? Since you have to apply through demat form only, there would not be any interest on the nonconvertible debentures. It’s irrelevant whether the company would deduct the tax deduction at source or not one has to state their interest in the income tax return and pay income tax based on the individual tax bracket. The duration of these NCD’s is for 24 months, 38 months, 60 months and 90 months tenure. Do you want to pool your money in high-risk NCD for 5 to 7.5 years? We do not have any idea that how the company would perform beyond 3-5 years, hence you should always invest in short term NCDs. You can look for 24 months or 38 months secured NCDs as these are for short term and they are secured in nature. Muthoot Homefin India NCD offers to yield up to 10% interest per annum, however, is high risk. If you have the high-risk appetite, investing in some of the diversified portfolios of large-cap, diversified and balanced mutual funds can fetch you around 15% annualized returns. Secured NCD is much preferred over the secured NCD. If you are a person of high-risk appetite and still wants to consider investing in these NCDs after financial crunch and scams then you can go for it. I hope you had a great time reading about the “Muthoot Homefin India NCD”. You can connect with us through the comment section given below and share your views and doubts with us. If you have enjoyed this article please do share it with friends and colleagues via facebook and twitter.